The free to play (F2P) business model has been with the games industry for years, yet we hardly understand it. This past week I’ve chanced across a few different items which explore aspects of the F2P model. Back in November, the IGDA Phoenix group had a presentation on F2P methodologies. 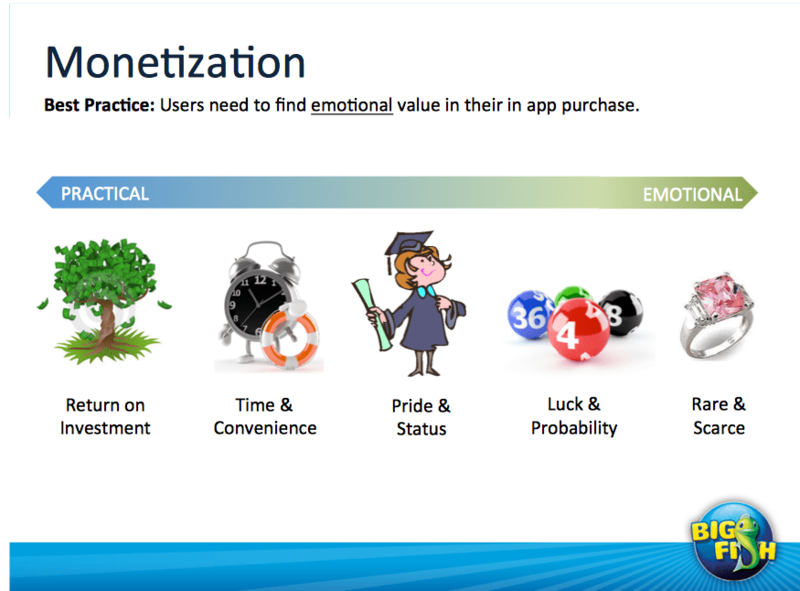 It’s a good presentation and provides some insights into a few popular F2P games and how their design decisions make sense. Whales are people. In social and F2P games, developers refer to people who spend a lot of money on a game as whales. The vast majority of gamers (>90%) who play free games never spend on them regardless of how many in-app purchases a game offers. So the business model has boiled down to getting as many players as possible then hoping that someone out there will love the game so much they spend a TON of money on it. Game developers have always assumed that this random approach is logical. Even though, developers also assumed that the people spending ~$50 on a game must be crazy. Ubisoft just did some research on whales and why found out that whales are more rational than assumed. Supercell’s Clash of Clans has been a huge success and their sequel of Boom Beach looks to prove Supercell’s design choices are rather smart. Redditor wolfawap spent some time and researched how Clash of Clans puts a price on time. The short of it is “they seem to set fixed prices for fixed time milestones like 1 minute = 1 gem, 1 hour = 20 gems, 1 day = 260 gems, etc.”. Let’s try interpreting the data differently. 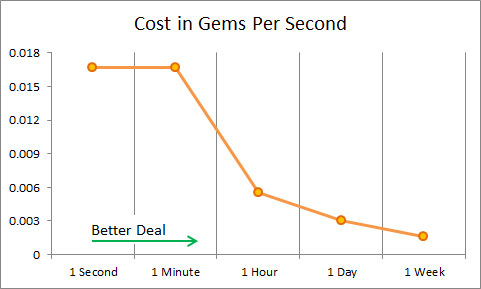 Think of it in terms of cost in gems to skip 1 second. Skipping more time costs more money, but you get a better deal. Think of it as a set of increasing discounts.